The full-scale replica of the titular giant robot in Mobile Suit Gundam is fully armed and operational over in Japan once more. 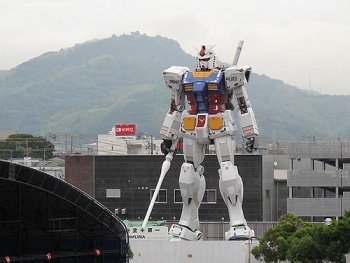 Almost exactly a year ago, the life-size 1:1 scale replica of the RX-78-2 Gundam was completed in Odaiba, Japan. Then, the Japanese took it down, because they apparently hate things that are awesome. Then, they decided to put it back up again, only this time they'd be giving it its iconic "beam saber" weapon. Well, guess what? It's finished again, and it is just as awesome as it's ever been. From the photos posted to Ngee Khiong, it looks like the only thing yet to be completed is the beam saber itself, which will supposedly light up at night as if it's burning a gash into the stone outside JR Shizuoka Station in Shizuoka City. The Gundam will be officially on display from July 24th, 2010 till January 10th, 2011, at which point it is scheduled to be taken down again because the Japanese people still apparently hate things that are completely awesome. Gundam is one of Japan's longest-running anime franchises following the airing of Mobile Suit Gundam in 1979. It's spawned countless sequels and spinoffs, the most popular of which are Gundam SEED, Gundam 00, and Gundam Wing. I've never understood the massive love for Wing, myself. The others are so much better. Well, okay, maybe not SEED Destiny.